This post is sponsored by Regalo. Thank you for the Regalo Easy Diner Hook On High Chair and for the opportunity to share this information with my audience. Please note, this post also contains affiliate links. As always, all opinions are my own. It was almost exactly a year ago that I was in my kitchen starting Baby Led Weaning (BLW) with my second daughter. Having used BLW with my first daughter as well, I had a growing interest in how this approach to infant feeding had evolved into one that more and more families in the States are starting to adopt as well. That's why when my best friend scheduled a visit to Texas right at her daughter's 6-month milestone, I was eager to know if and how they would be introducing solids. As their visit got closer, it was a delight to know my friend wanted to initiate BLW while they were here. What a treat for me to help her with! This post includes many of the FAQs that came up both with my friend and as submitted by many fellow moms. I hope the content below will be a helpful starting place when it comes to starting solids with BLW - both at home and when away. Just because my child is 6 months old, can I assume they are ready to start solids? Although most organizations recommend starting solids at or around 6 months (as discussed in an article shared here), there are other considerations to keep in mind before jumping into BLW. When an infant is spoon fed purees, some parents may hastily assume their infant can already handle food since it requires less coordination of their gross, oral, and fine motor skills to be spoon-fed purees versus self-feed soft table foods. Some signs of readiness that matter particularly with BLW, however, are for an infant to show the developmental signs of readiness to self-feed (as shared in a post here and here). When an infant shows adequate head control, core strength, the ability to open their mouths to food, loss of tongue thrust, and the fine motor skills necessary to self feed, a parent can safely and effectively move forward with BLW. Ensuring these developmental milestones have been met before starting solids allows the infant to focus more on exploring the food and self-manipulating it towards their mouth, as well as the actual act of eating. When traveling, can I just hold my infant in my lap to feed them? I would prefer not to worry about toting along a high chair. For ease's sake, this is an understandable question most parents ask. Without wanting to pack even a traditional chair-topper "portable" high chair, it can be tempting to feed your infant from your lap. This is not recommended, however, for a few reasons. One, it is important that your child is in a safe and secure location. Part of the autonomy developed with BLW is your child's ability to self-feed (in a safe way). 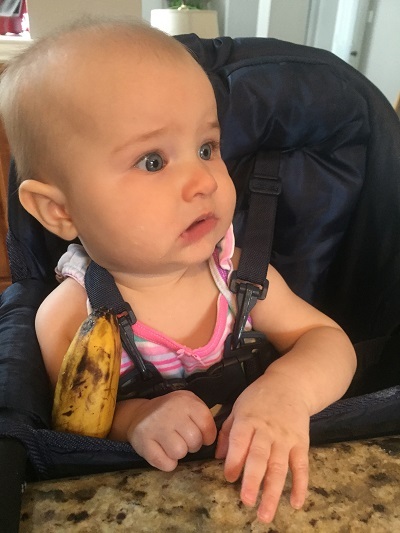 Your securing them into a high chair allows them to lead this process, regulate the pace of feeding, and gain coordination in doing so from a seat. Further, it is important that you are always able to see your child's face as they eat. In order to ensure safe feeding practices and prevent choking, parents need to be able to supervise their child. Attempting to do so with an infant seated in your lap, most often facing outward with their back to you, would be both awkward and ineffective. Lastly, the more support you can provide your child while eating the better (that goes for all ages!). Offering an adequate back rest, base, and ideally spot for feet allows your child to have the reinforcement they need to successfully self-feed. For a safe, affordable, and compact option, the Easy Diner Portable Hook On Chair satisfies the needs parents have while traveling. It comes in a bag where the chair easily breaks down and lies flat, slim enough to slide into even that outer zipper area of a suitcase. The chair then reassembles easily so that you can securely attach it to any table or counter (assuming there is no lip underneath). We used our Hook On Chair often when traveling with littles and appreciated how easy this set-up worked when having to pack all the items needed for infants. Possibly what I appreciate most though is that this Hook On Chair is not exclusive to travel. Even with a more traditional high chair in our home, I can't imagine our infant years with each child not having a Hook On Chair. Similar to how the Learning Tower is a mainstay at our island, hook on chairs were their vehicle for "at the counter" engagement until they became big enough to stand at a learning tower like stool. This made me more pleased with my purchasing this for travel, as I was able to extend its life at home on the counter, to complement the traditional (non-portable) high chair that stayed table side. Besides making sure my child is safely seated, how can I prevent them from choking? It seriously freaks me out. One of the best things parents can do prior to starting BLW is to educate themselves. A few of my other favorite resources for parents to consider in order to better familiarize themselves with BLW and the associated safety precautions include this flagship BLW book as well as a newly released book called, Born to Eat. A couple of online infant feeding classes specific to BLW that I also highly recommend are those by Registered Dietitians Megan McNamee at Feeding Littles and Jessica Coll of JessicaColl.com. What are some of the best foods to start BLW with? Baked sweet potatoes: Baked whole; cut into 1/8 lengthwise to offer long strips. May cut strips in half so they are a fist-and-a-half long. Eggs: Scramble into pieces large enough for infant to hold in their fist or boil to make an egg salad they can scoop with their fingers into their mouths. Yogurt: Choose a whole milk, plain flavored yogurt. Don't fall for "Yo-Baby" as an ideal choice for infants. Give them a small, safe spoon to use or allow them to use their fingers to self-scoop. French Toast: Using breastmilk and eggs, soak whole grain bread (free from whole nuts or seeds on the crust). Cook until golden brown and then cut into 2 inch strips. For additional flavor, you may also add other items into the milk and egg mixture, including flavors like cinnamon, nutmeg, vanilla, applesauce and/or plain, canned pumpkin. Peanut Butter: Using the yogurt or french toast ideas from above, introduce peanut butter by swirling it in until well mixed with yogurt. Or, thinly smear onto a warm finger-like strip of french toast. Steak: Cooked medium to medium well so it is juicy and tender. Cut into fist-and-a-half long strips. Do not add any salt-containing seasonings or marinades; may season with any other herbs or spices, however. For more ideas on how to offer fruits and vegetables for BLW (including specific instructions for how to cut and cook), check out the post I shared here. How do I know if a food is safe to offer my baby? In general, there are three rules of thumb parents starting BLW should know. One, offer a "finger-like" strip of food. More specifically, give your child strips of food that are about one-and-a-half lengths of their fist. Visually, this means that even with a good grasp on the food item, your child can still have some sticking out to eat from. This helps your child to learn how much they can safely handle in their mouth at one time. This also gives parents a safe target for the most appropriate shape of foods to offer children ages 6-8 months old, before their pincer grasp develops (closer to 9 months of age). Two, do the "smoosh test" (my technical term here). If you are ever in doubt about if a food may or may not be safe for infant self-feeding, press it firmly between your pointer finger and thumb. Similar to how a ripe avocado would "smoosh" when pressed in this way, a safe food should be soft enough should do the same. This allows infants, even without teeth, to firmly gum their foods in a way that smooshes them down to an almost pureed like texture. Three, avoid foods that could break off easily into small pieces. Such foods may create a small choking hazard that could block baby's airway. Such foods often include raw fruits and vegetables that are hard, crunchy, or overly firm (think carrots, apples, raw broccoli and cauliflower). For any of these foods, find other ways to serve them either cooked (to a consistency that meets the smoosh test) or finely chopped and added into another food item (like muffins, pancakes, sauces, etc.). Are there any foods I need to avoid all together with BLW? In short, yes. While there are some obvious foods, such as those that are choking hazards, there are also ingredients that are best avoided in infancy. In a post I shared here, the following foods are best avoided: added salt, added sugar, and choking hazards. The best foods to encourage are those that include iron, zinc, vitamin D, and fats, especially omega 3s. What do I do if the food feels too slippery for my infant to pick up on their own? With BLW, one of the best known tricks for this is to roll any slippery food item (like mango) in almond meal or oat cereal (you can also use infant rice cereal). This will cut down on how slippery the item is while also giving a little nutritional boost to whatever makes it into their mouth. One reality to learn how to embrace in this season though is that of messes. Particularly with BLW, it is messy! The self-exploration of foods at this age will end up all over. That isn't something to try to tame or discourage though. Infants ability to explore new foods, textures, and feelings in both their mouths and hands (and likely hair!) gives them valuable experiences to store when learning new foods. Instead, find things that make your life easier like bibs that actually stay on (this one and this one are two of my faves), a splat mat (or old bedsheet!) to catch what falls, as well as a sustainable system for cleaning up after your messy kid. The removable insert in the Regalo Easy Diner Hook On Chair is an ingenius addition to this portable high chair. Unlike some of the other hook on chairs we have used or seen, this allows parents to remove the main insert on the chair where food may have fallen and made a mess. While the straps and chair itself will still need a nice wipe down after each meal, I appreciate how I could remove this piece of the chair without completing disassembling and washing the whole thing. Do I need to space out foods or use the "wait rule?" My child does not have a family history of food allergies. Research shows that parents with children who are not at increased risk for food allergies do not need to wait 3-7 days between the introduction of different foods. For families with a history of food allergies, speak with your pediatrician about what the preferred approach is and how much time they suggest you take between introducing new foods. Otherwise, the more foods and flavors you can introduce early on, the more likely you are to spur your infant on as an adventurous eater. For families who find themselves in the kitchen and/or cooking often, this is another one of the reasons I love and encourage Hook On Chairs at the counter. Having your young child at a safe and yet close distance as you cook with you affords a naturally opportunity to get kids in the kitchen from infancy onward. It also reminds parents that starting your infant on solids isn't so much about the calculated effort of what single ingredient food to offer and when, but rather engaging them in the foods, flavors, and feelings that a variety of foods offers them at even an early age. Is there a feeding schedule I should follow? When introducing solids, most experts recommend that you start offering foods at one meal a day and gradually increase the frequency for when complementary foods are offered until your child begins to join in on three main meals as well as 2-3 daily snacks. This develops over 4-6 months however, from the time solids are introduced until 10-12 months when your child begins to get a better grasp on self-feeding (literally). Follow your child's lead as they begin to show more of an interest in food and ability to self-feed. Then you can begin to include them in more family meals and snacks to support their growing needs. The key here to remember is that whatever you offer your infant is intended to be complimentary. Starting BLW does not replace breastmilk nor formula, but rather is intended to help compliment it by adding important nutrients, flavors, and textures to your child's growing diet. Transitioning your infant to more of a schedule for WHEN to serve meals and snacks, while also factoring in WHAT foods you offer them and WHERE you will serve them (like in a Hook On Chair) begins to set the stage for any new parent to adopt the Division of Responsibility in feeding. As the most highly recommended feeding approach to use with children of all ages, I respect how Baby Led Weaning equips parents early on in what their role is with the Division of Responsibility in feeding while also respecting their child's role - even in infancy. The Division of Responsibility is something that is sorely missed in most infant education materials and often goes unheard of until later on when parents may begin to struggle with signs of picky eating. Instead, practicing this approach with your child from an early age makes maintaining a Division of Responsibility in your home a more natural transition when it comes time to feeding a toddler. For this reason and all the answers we worked through above, I am so grateful to have gotten my best friend "hooked" on BLW as well as the Regalo Easy Diner Hook On Chair. Being from a family I know loves to cook and travel, I know my best friend's daughter could use this as a portable way to engage in meals, snacks, and the cooking process for years to come! 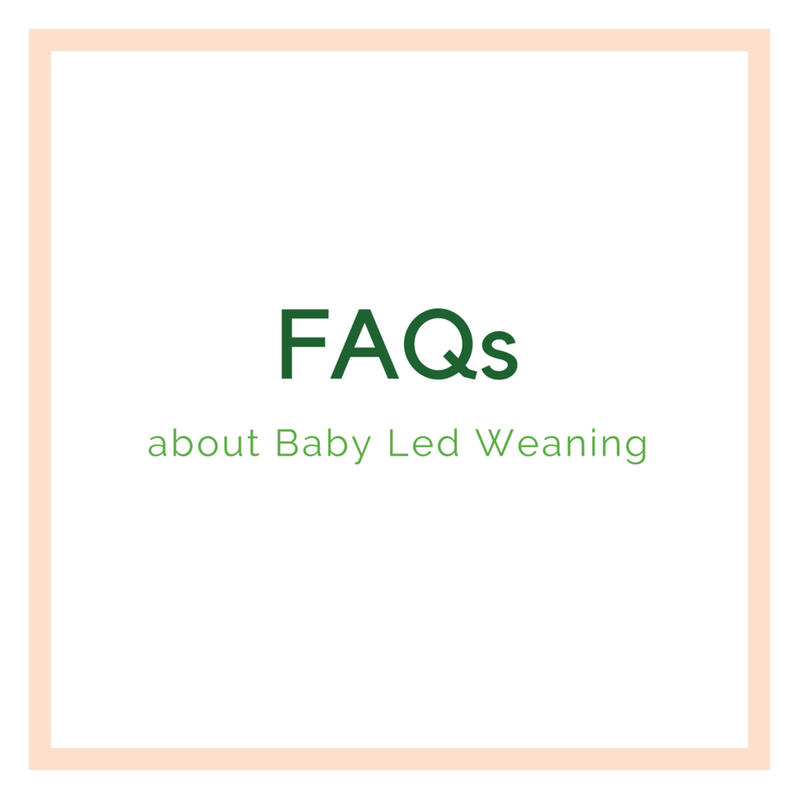 A special thanks to Regalo for this opportunity to share some of the FAQs for BLW, as well as for providing us with the perfect portable seat for my best friend's 6-month old to use during their visit. A special shout out to both Baby Tay-Tay and her mom, as well. You both did such a great job starting BLW in a safe and enjoyable way. Thank you for letting me be a part of your feeding journey! There is a lot of debate over if, when, and how to offer rice cereal to infants. Get your top questions about infant rice cereal answered here.